Programs allow unique process flows, data collection and user authorization for different managed clients within the ServiceCentral's Service Management Software Platform. One of the most daunting challenges facing after-sales product support and repair organizations is how to effectively manage the differentiation of processes/operations based on unique product design, sales vendor, customer warranty entitlement, technician skills, etc. Yes, the combinations are infinite and can be overwhelming, however, with the ServiceCentral platform, they are completely manageable via the configuration of programs and associated workflows built by your system administrators and tailored to suite your organization’s needs. 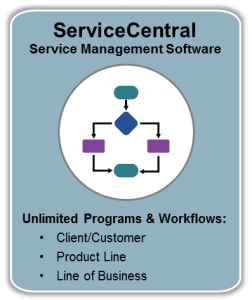 ServiceCentral’s Service Management Software is a fully configurable system designed for end-to-end after sales product support. Powerful administration tools allow for the configuration of unlimited programs and workflows that can be used for specific processes based on any combination of client/customer relations, product lines, and lines of business. Each program has a unique set of data collection steps, fields, information validation, and workflow capabilities, as well as user authorization for multiple managed clients. What Makes ServiceCentral’s Programs & Workflows so Effective? The fields displayed on each work order screen. The ability to identify required data and how to validate that data based on unique program specifications. Defining the next steps available in each step of the work process based on unique program specifications. Reporting, crucial to tracking and streamlining repair progress and employee performance, can be executed within a program and/or across programs. ServiceCentral’s ServiceIntelligence™ reporting modules are also fully configurable, and will track trends, goals, and identify inefficiencies. With ServiceCentral you can create and send unlimited reports, add graphics for visual comprehension, and customize output for the specific audience. Put in a nutshell, the ServiceCentral platform will help your business maintain top notch customer relationships and retain existing clients by combining and streamlining customer service and product support operations. The software is easy for users to learn and use, and for management to track overall operation activity. With unlimited programs and workflows, your organization will be elevated to new levels of business intelligence, productivity and accuracy. Click here to schedule a demo of ServiceCentral today.